Matthew Bartholomew jumps at the chance to travel to Ely with Brother Michael, as it will give him a unique opportunity to study in the richly stocked library of the Benedictine priory. Michael has been summoned to the city by his bishop, but it isn't until they arrive that they discover the reason - the bishop has been accused of murder. The charge seems ludicrous, but Michael takes the investigation seriously and energetically sets about his task. Almost immediately he discovers that there appears to have been a series of unexplained deaths in the area. At the same time Bartholomew comes across an underground movement of rebellion against the church and the tithes they demand from the laity, and the two men also learn that there has been a spate of burglaries which are being blamed on a band of travellers. Then a fellow of the priory is murdered almost under their noses. Can this death be connected to the others? Are all the killings linked to the burgeoning rebellion in the city? 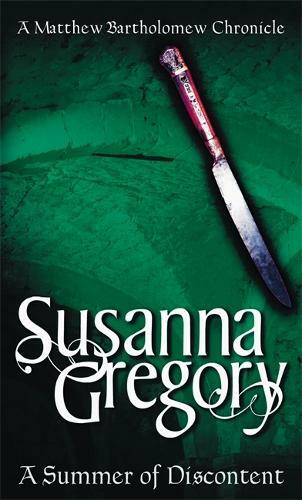 Once again Susanna Gregory has created a superbly crafted mystery narrated with wit and style against a perfectly realised period background.